In Windows 10 Insider Preview 17666 (RS5), the insiders were offered to test an earlier version of the cloud clipboard feature. At the request of members of our community who are not participating in the Windows Insider program, we publish a few screenshots of the new feature. The user can conjure up the new Snipping tool for creating screenshots by pressing the hotkeys Win+Shif+S. The feature allows you to take a shot of the entire screen or a certain area thereof (either rectangular or free-shaped). By default, its main window appears at the top of the screen. The current version does not allow the user to drag it around. Nor does it support taking screenshots of the active window. The captured snippet of the screen is automatically copied to the clipboard. Further, the user can easily paste it in any compatible application. Through notifications, Windows 10 suggests proceeding to edit, save or send the screenshot to other users in the native editor “Screen Sketch” from the Windows Ink set. 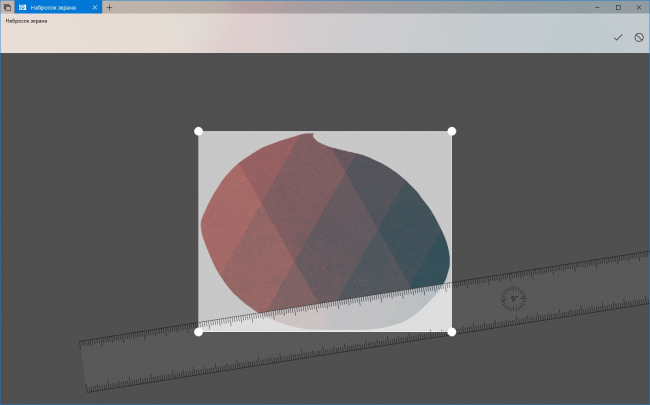 The Screen Sketch editor has several very simple tools for drawing and text selection. With its help, the user can crop the image, save it as a PNG file, copy it to the clipboard, or send it to another application. If necessary, you can resample the screenshot directly in the editor window. Besides, this application can serve as a stand-alone graphic editor. The program can open external files and is available in the Start menu, instead of being hidden from the user’s eyes on the Windows Ink panel. The hotkey combination Win+Shift+S is not convenient for everyone as a way to conjure up the new feature. That’s why the developers have envisaged its quick launch from the Action Center or by pressing the classic PrintScreen key. For the Screen Snippet to start when you press the PrintScreen key, you need to enable this option in Options → Special Features → Keyboard. So far, the feature has no other adjustable parameters or settings. Worth recalling, the above screenshots demonstrate an early preliminary version of the new feature. Much is likely to change before the official launch of the final version, which will happen in autumn 2018.